Allow two hours for an amazing visit. After your walk through the rooms you can take tea on the rear patio, or even sit in the gardens and eat your own sandwiches. Between 5,000 and 7,000 people go through every day, up to three quarters of a million over the two months. 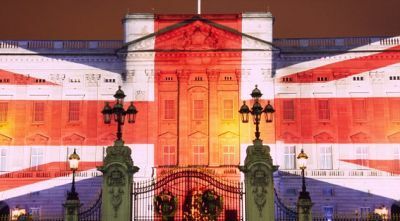 The Queen also hosts 50,000 to the garden parties and other events every year, and typically during the Olympics welcomed all the visiting Heads of State. 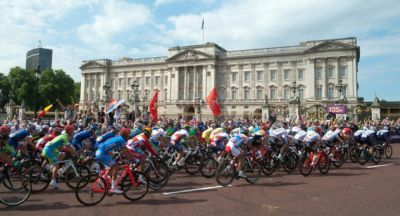 The Palace is very well used. It does not show! Nearly 20 years ago when Buckingham Palace initially opened to the public your Editor was one of the first to book a tour. He also drove into the Palace courtyard in 1960 to collect his Duke of Edinburgh’s Award – things have changed. Perhaps the years dim one’s view but last week the building seemed brighter than ever, and there was much more to see. Over the period of public openings the Palace has got far better organised with its welcome, very, very friendly, and the audio guide is one of the best. Prince Charles starts it off. There is one big misconception. Buckingham House, as it then was, dates from 1705, but has been re-built on a number of occasions, John Nash (him of the Regent's Park terraces) being one of the principal architects. What we see today facing the Mall is actually the rear of the original Palace. The Marble Arch, originally the gateway, was removed to its present site in 1850 during Prince Albert’s rebuilding. The Victoria Memorial was dedicated in 1911. Your tour takes you through the Palace's 19 State Rooms. Under the patronage George IV (1820-30), an avid collector, Nash transformed the former mansion into a grand palace. Many of the pieces of furniture, sparkling chandeliers, candelabra and other works of art in these rooms were bought or made for Carlton House, George IV's London home when he was Prince of Wales. Today the State Rooms are furnished with many of the greatest treasures from the Royal Collection, including paintings by Van Dyck and Canaletto, sculpture by Canova, exquisite pieces of Sèvres porcelain, and some of the finest English and French furniture in the world. Many of the other State Rooms also have particular uses today. It is in the Throne Room, for example, that The Queen, on very special occasions, the Jubilee for instance, receives loyal addresses. On 29 April 2011 this room was the setting for the formal photographs following the wedding of The Duke and Duchess of Cambridge. 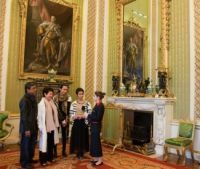 In the Music Room, guests are presented to The Queen, The Duke of Edinburgh and the visiting Head of State on the occasion of a State visit. The White Drawing Room, perhaps the grandest of all the State Rooms, serves as a royal reception room for The Queen and members of the Royal Family to gather before official occasions. Outstanding is the 50-yard long Picture Gallery with its translucent roof allowing in the daylight. 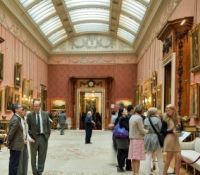 The pictures hung in the Picture Gallery are changed quite regularly, as The Queen lends many paintings to exhibitions around the UK and overseas. The current display brings together Italian, Dutch and Flemish works mainly from the 17th century, grouped by subject and artistic nationality. 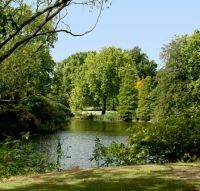 Among the great artists represented are Titian, Vermeer, Rembrandt, Rubens, Van Dyck and Claude. The room is occasionally used for dinners in support of charities or organisations with royal patrons. It is also here that the recipients of honours assemble before being led into the Ballroom for their investiture. 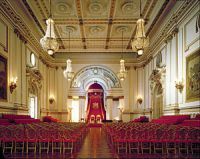 The Ballroom itself was once one of the largest rooms in London and is often seen on TV for the Royal Investitures. It is very impressive and the only place to sit down during your tour (and there are no bathroom facilities until the gardens). The theme for the current opening is the Royal Diamond collection, probably the greatest in the world. Many of the jewels being put on show have been used and worn on state occasions by different British monarchs over the last three centuries. The collection includes pieces made from the Cullinan Diamond – the world's largest – which weighed 3,106 carats as an uncut stone. Jewellery containing seven of the nine principal stones cut from the diamond are reunited for the first time. They include the Cullinan III and IV Brooch, worn by the Queen at the National Service of Thanksgiving for her 60-year reign, at St Paul's Cathedral, in June. 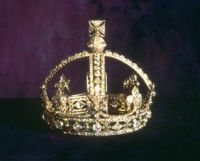 Several of the jewels on display have not been exhibited to the public before, such as the Delhi Durbar Tiara and the Kokoshnik Tiara. Jewellery commissioned by Queen Victoria – the only other monarch to celebrate a Diamond Jubilee – are also on show, including her coronation necklace and the miniature diamond crown, much associated with her, and borrowed from the Jewel House at the Tower of London. It is one of the most celebrated of pieces being very small and extremely intricate. The necklace was also worn by Queen Alexandra, Queen Mary, Queen Elizabeth the Queen Mother, and Queen Elizabeth II at their coronations. The Diamond Exhibition is one of the last things to see on the tour. It is then back to the real world. There is now limited availability on tours until the end of the season, although if you want to book “A Royal Day Out” which also includes The Queen's Gallery and The Royal Mews, more dates are possible.